Florida has many military members, with some of the nicest duty stations. These include Key West, Pensacola, and Jacksonville. Military Members and their spouses also settle in Ocala and Gainesville. If you are a member of the military, or if your spouse is a member, you should know your basic rights and benefits. Judgements: The first is that the Service Members Civil Relief Act prevents a court from putting a judgment against you if you have been deployed under certain circumstances. This protection covers not only regular military members, but also members of the National Guard or Air National Guard while they are deployed. Military Retirements: Distribution of military retirements has a special section in the Florida Statutes. For military members who have been married for more than ten years, Florida divorce law requires that sufficient information be provided to identify the military member, and that the Service Members Civil Relief Act was followed. Once a service member’s retirement pay has been awarded to the spouse, it can be enforced under the Uniformed Services Former Spouses Protection Act. This federal law provides a method to enforce military retirements. It also protects military members by ensuring that the Service Members Civil Relief Act was followed. Health Insurance, Parenting Plans, Child Support: Other issues also come up often. These include health insurance (spouses can request continued Tricare coverage for up to 36 months), military ID cards, and parenting plans when someone is on active duty. Some members are permanently stationed somewhere; others may be deployed. Special attention needs to be given to all these items. 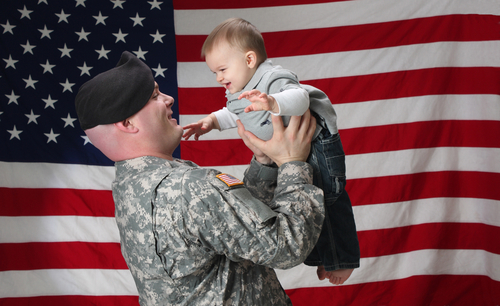 Helping determine a military member’s income is also important if you are calculating child support. All military members receive a base pay. In addition, active duty members often receive allowances for housing or food. These are generally not taxed, and a member’s Leave and Earning Statement will show these details. Personally, I served in the U.S. Navy for six years, and served as a Naval Reservist for four years. I am proud to have served. Like many prior military members, Veteran’s Day and Memorial Day have special meaning for me. The rights of our military members should be protected. Equally important, though, are the rights of every spouse who supports his or her Soldier, Sailor, Marine, or Airman. We can assist you, and we salute all who have served.